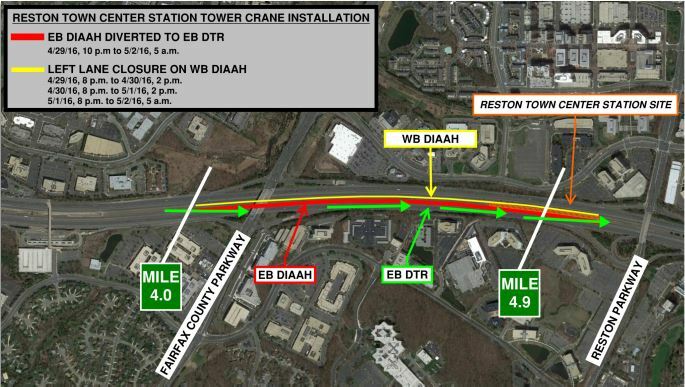 On or about Friday, April 29, through Monday, May 2, Dulles Corridor Metrorail Project crews will assemble a tower crane in the median of the Dulles International Airport Access Highway (DIAAH) between the Fairfax County Parkway overpass and the Reston Parkway overpass. The crane will be used for construction of the Silver Line's future Reston Town Center Station. Work will take place during day and night hours. All work is weather dependent and subject to change. Friday, April 29, 10 p.m. to Monday, May 2, 5 a.m. Eastbound DIAAH traffic between mile markers 4.0 and 4.9 will be diverted to the left lane of the eastbound Dulles Toll Road (DTR). Eastbound DIAAH traffic to the Fairfax County Parkway will be diverted to the Dulles Toll Road at mile markers 1.8 and 2.7. Signage will be in place to inform drivers. Eastbound DIAAH traffic to the Reston Parkway will be diverted to the Dulles Toll Road at mile marker 1.8. Signage will be in place to inform drivers. Eastbound DIAAH traffic will return to the DIAAH at mile marker 4.9, just prior to the Reston Parkway overpass and all lanes will be restored for eastbound DTR use. Friday, April 29, 8 p.m. to Saturday, April 30, 2 p.m.
Left lane of westbound DIAAH between mile markers 5.0 and 4.0 will be closed. Saturday, April 30, 8 p.m. to Sunday, May 1, 2 p.m.
Sunday, May 1, 8 p.m. to Monday, May 2, 5 a.m. Drivers are asked to use caution and remain attentive to all signage, barricades, adjusted speed limits. Large, slow-moving vehicles may be exiting and entering the highway at various times.